We love to hear from our customers because we value what you have to say. We have collected a sampling of questions which customers commonly ask and we hope that the following curtain side trailer related, frequently asked questions are helpful to you. But, if you don’t see your question listed, we want to hear from you and encourage you to submit your question, allowing us to quickly reply back with an answer. Click question header to get the answer. [fa icon="plus-square"] What does Roland Curtains do? • Roland offers the complete trailer or van body. • Roland can install its Curtainside Upper Structure System on your flatbed chassis. • Roland also offers the Curtainside Upper Structure System as a kit for assembly by the customer or their local service shop. • Roland’s highly qualified and experienced engineering staff exceeds the custom design specifications of your project. [fa icon="plus-square"] What cargo can be hauled in a Roland Curtain Side Trailer? Plus any cargo that needs high levels of protection with unique loading and unloading capabilities including side and overhead access. [fa icon="plus-square"] Who is operating Roland equipment? [fa icon="plus-square"] What makes RolaLoad Curtainside System different? 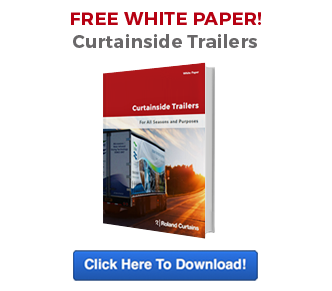 There are a number of curtainside trailers in the marketplace today and it is IMPORTANT to know exactly what you are buying and why. Here’s a few facts to help you get what you want and need. Weld or Bolt: There are approximately 1,500,000 curtainsiders in use throughout the world, of which around 40,000 operate in the U.S. Only 3% - 5% of these are a welded construction. The RolaLoad Curtainsider is bolted at four corners of the trailer chassis and has stress relieving joints at the roof connection. Rip or Stop: One myth is that curtain material is rip-proof. Truth is, no manufactureer in the U.S. uses an absolute rip-stop curtain material. High security curtains are available (RolaSecure & RolaSafe) and prevent entry for the cargo. Options: Are you aware that you can custom spec your unit with swing doors, roll-up doors, sliding curtains, solid rear-end, or even a sliding curtain roof? Center partitions, cargo control systems, insulated curtains, fixed posts, removable posts and even sliding racks can be added. Need high resolution, digital graphics on the curtains, vinyl decal on the front or rear? The options are almost endless. Height: The usable side access height of a RolaLoad Curtainsider is the dimension through the side, over the floor and under the top rail. The top rail is a nominal 3.625” deep. That, combined with the upper coupler depth, provides an additional 4" inside height as compared to other systems. [fa icon="plus-square"] What solutions does Roland's Curtain Side Trailer offer?